In an interesting official statement published by the Sadrists, Muqtada al-Sadr tackles the question of a second Maliki premiership head on. 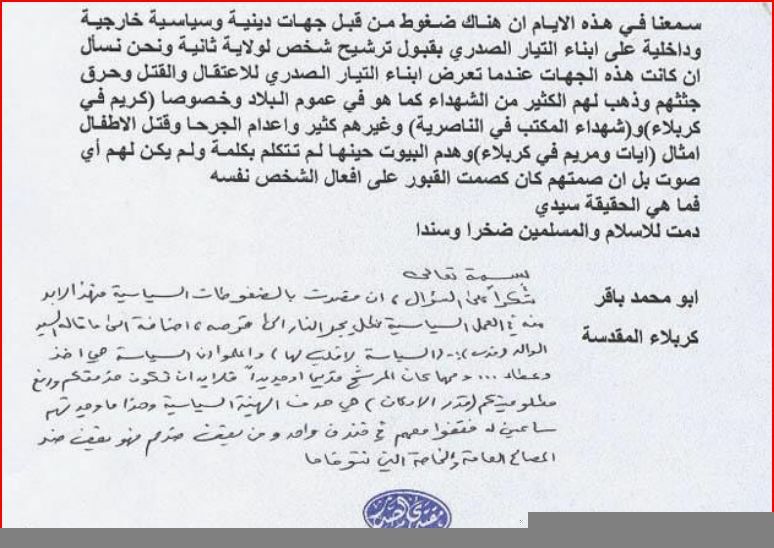 The document simulates the format of a “request for a fatwa” and the questioner asks how a second Maliki premiership can be acceptable given the highhandedness of the Maliki government against Sadrists in numerous locations across Iraq (Karbala and Nasiriyya are highlighted). Sadr’s reply is interesting: He alludes to the “give and take” of politics and cites his father (as he always does in these quasi-fatwas) to the effect that politics is a heartless game. He then goes on to order his followers to support whatever position is taken by the Sadrist politburo! This could, in other words, be another indication that the Sadrists are preparing to switch allegiance to Maliki, this time probably with Iranian support in order to achieve their basic aim of having a (mostly) unified Shiite front in the government-formation process. It is interesting that the normally pro-Iranian Islamic Supreme Council of Iraq (ISCI) have gone quite far out on a limb in an attempt at challenging Maliki. Today, Iraqi media are full of rumours about a reported visit by Sadr himself to Syria, ostensibly to talk to Iraqiyya; so far however only a meeting between the Syrian president and the Iraqiyya leadership is reported. A more realistic scenario would probably have been Sadr talking to ISCI and others in the Iraqi National Alliance (INA) half of the putative all-Shiite National Alliance (NA) that remain sceptical towards Maliki (Sabah al-Saadi of Fadila indicated such scepticism today), but so far nothing of the kind has materialised. In that case, the interesting question is how big the INA defection from the NA will be if Maliki after all emerges as their premier candidate. The recently-finished nightly meeting of the putative all Shiite National Alliance combining State of Law and the Iraqi National Alliance (INA) stands out if only because the poker play went a little further than usual: ISCI was absent; the rest of the parties apparently came very close to declaring Nuri al-Maliki their prime ministerial candidate. The scenarios sparked off by this constellation of players are intriguing: Would ISCI really be prepared to defect from the Shiite umbrella in order to voice their contempt for Maliki? If so, would it do the only logical thing after so much dialogue with the secular Iraqiyya on the anti-Maliki theme, i.e. support Ayyad Allawi as premier candidate despite the wishes of Iran (which used ISCI to start the process towards forming the NA in the spring of 2009)? It would have been something of a political earthquake, but the numbers could have added up: Iraqiyya has 91 seats, ISCI including Badr around 17, the Kurdistan Alliance 43 with further support from Kurdish independents and some of the minority representatives amounting to maybe 15 extra deputies. Altogether some 166 MPs on a good day, just above the magic 163 mark. In the end, it wasn’t quite that dramatic. Despite a simultaneous meeting between Iraqiyya and Ammar al-Hakim and Adel Abd al-Mahdi of ISCI (he is ostensibly the INA candidate to compete with Maliki), Hadi al-Amiri, the chief of the Badr organisation, was reportedly present at the NA meeting, and the meeting itself decided not to formally adopt Maliki for the time being, giving ISCI instead 48 hours to come around (and with some Sadrists for the nth time indicating doubts about Maliki). Perhaps what the episode underlines more than anything is the gradual marginalisation of ISCI within the NA. If Badr stays with the other Shiites, there will be less than ten deputies left with ISCI – certainly something to think about for American and other Western ambassadors who tend to use Abd al-Mahdi and Hakim as their main points of contact with the INA half of the NA. And, importantly, also something that would impact on the arithmetic of it all: Any ISCI/Iraqiyya/Kurdistan Alliance project would fall below the 163 mark again. Several events scheduled for October might create additional hiccups for the Iraqi government-formation process. At the same time, they serve as an indicator of an unhealthy climate in Iraqi politics where personality issues prevail at the expense of ideological questions, creating illogical alliances and preventing more logical ones from materialising. The most prominent of these issues is the census scheduled for the second half of October – Iraq’s first since 1997. Holding the census is seen as controversial by many Iraqi nationalists, including Arabs and Turkmens living in northern parts of Iraq that fell to Kurdish control during the chaos that reigned during the first days of the Iraq War in 2003. Their fear is that Kurdish dominance on the ground will create biases in the way the census is conducted, with the potential of results that may be used by the Kurds in their quest to annex some of these areas which they claim as “disputed” ones. Even though the holding of a census in itself is not a political issue, the explicit mention in the Transitional Administrative Law of 2004 of a census as a step towards the settlement of so-called disputed territories means it will be seen as political pending the resolution of those territorial issues. In terms of policy contradictions, it is the position of Prime Minister Nuri al-Maliki that stands out in this regard. Back in 2008, when Maliki turned to Iraqi nationalism, he for a while seemed to challenge Kurdish expansionism in the north and saw his popularity increase among some Sunni Arabs and Turkmens as a result. As late as in 2009, he played a role in delaying the census one year despite Kurdish pressures to have it conducted on time as per the census law adopted by the Iraqi parliament. However, since the autumn of 2009 – as the result of a series of events that led to Maliki’s greater isolation from much of the Iraqi political establishment from the August explosions in Baghdad onwards – the Iraqi premier has been increasingly conciliatory vis-à-vis the Kurds, seeing them perhaps as his best option for a post-election alliance at a time when he was probably inflating the potential for a big State of Law victory in the March 2010 parliamentary elections. During the debate on the election law, State of Law supported “special” but ultimately extremely diluted arrangements for Kirkuk that essentially gave the Kurds what they wanted there, and went on to support the Kurds during their attempt to exploit the veto of the law by Tareq al-Hashemi to achieve a new seat allocation formula more in tune with Kurdish demands. There was some limited but not decisive rapprochement on oil exports, and the Kurds offered some support to Maliki when he came under pressure in the shape of a projected “law on electoral conduct” and the debate on the budget. Now, indications are that Maliki will support holding the census on time. A second possible showdown relates to the standoff regarding the national football committee – delayed for more than a year, but now also scheduled for October. Here, Maliki is facing off against prominent sports personalities that have a background in the old regime and that still receive some support internationally from FIFA, where there is a strong Arab voice within the Asian branch of the organisation. As ever, though, the conflict is not one hundred percent clear cut. Maliki has also promoted sports stars that have a background with the old regime. Rather, there is concern about the ways the government is trying to impose its own candidates to be coaches for important football clubs, as a springboard for eventually taking control of the football association itself. There is an added territorial dimension, too, with the football association and FIFA insisting on holding their elections in the Kurdish areas (“Baghdad is unsafe”), with Maliki of course preferring to have Baghdad as the venue of the elections since in his view it would be more normal for the capital to host such events. Again, the contradictions: Iraqiyya supporters in this case flocking to the Kurds with whom they disagree fundamentally on so many territorial issues; Maliki the centralist appearing to wake up again, if more reluctantly than before. And finally, there is the reported revival of Basra federalism demands which would create even further contradictions if a referendum gets underway in earnest (such rumours also surfaced last winter). In this case, Maliki the centralist could face challenges from his own ranks, where State of Law members in the Basra provincial council now express more pro-federal sentiment than they used to only a year ago, when a similar scheme was launched only to fail. Multiple news reports out of Iraq suggest some forces in Iraqiyya are aiming for a deal that could either prolong the government-formation process quite considerably, or end up with the disintegration of Iraqiyya itself. In the outlined deal, Adel Abd al-Mahdi of ISCI would become prime minister, a Kurd would get the powerful speakership of parliament, and Ayad Allawi would be president – a position that currently has no privileges after the termination of the transitional tripartite presidency that was in force from 2005 to 2010 – that is, except fast cars and a nice office. Of course, any such deal would still take some time to complete, since Adel Abd al-Mahdi would have to be the candidate of the biggest bloc in parliament and Iraqiyya and INA would have to formally merge for it to work (INA would first have to secede from what is currently called the National Alliance of itself and State of Law, and it should be noted that so far only Iraqiyya politicians are talking publicly about the deal). And apparently, some in Iraqiyya are hoping that the presidency will be strengthened, through constitutional revision prior to the seating of the government! Do these leaders – and America – realise what kind of can of worms will open if constitutional revision is attempted prior to or simultaneously with the government-formation process? But then again, it seems some Iraqiyya leaders are prepared to go to any length in order to avoid sharing power with Nuri al-Maliki. What a truly Delphic assertion. At first sight one might wonder whether Obama was trying to put the Maliki government on notice by designating it as “a caretaker government” instead of a normal one. But no, a closer look at statements by White House spokesman Robert Gibbs and Vice-President Joe Biden suggests that there was in fact an attempt at putting a positive spin on the situation in Iraq. According to Gibbs, “more importantly, there is a caretaker government that is making decisions on behalf of the Iraqis.” And then Biden, “unlike after the last election, however, a caretaker government is providing security and basic services and preventing a dangerous power vacuum from erupting”. Aha! A caring caretaker government that carefully takes care of Iraq. So it was meant to be positive, after all. The problem is that it all resonates poorly with the Iraqi debate on the subject, and moreover that the labelling of the Maliki government as a “caretaker government” is in fact fallacious and unconstitutional. Here is why. In the autumn of 2009, enemies of Nuri al-Maliki in Iraqiyya and the Iraqi National Alliance (INA) began making strenuous attempts at labelling the government as a “caretaker” one in an attempt at restraining Maliki’s spending powers prior to the elections. They appeared not to care a fig that such a designation was a legal concoction with no basis in the constitution, but eventually modified their demands – first to a “law on electoral conduct” that would go some way towards restraining Maliki but was never passed, and then by restricting Maliki’s spending powers somewhat in the 2010 budget. But of course throughout this period the government maintained exactly the same legal status, since there simply is no constitutional provision for changing the status of the government after an election. Such a change in status comes into effect only if parliament is dissolved prematurely; otherwise all that is specified relates to the steps and the timeline for forming a new government. It should be added that Biden’s attempt to create a contrast to the situation in 2006 is also erroneous. Just like the constitution adopted in 2005, the Transitional Administrative Law that remained in place under the Jaafari government did not explicitly change the status of the government subsequent to the first legislative elections; rather it stipulated a deadline for the formation of a new one (31 December 2005) which like all other deadlines in Iraq was cheerfully violated, in that case by around six months. One may still wonder how this curious designation found its way into the White House. One possible route is through Ad Melkert of UNAMI, whose ideas are often listened to by the Obama administration. In early August, before the UN Security Council, Melkert said “a common understanding seems to have evolved last week among all political blocs over whether indeed the stage of a ‘caretaker’ government has been reached.” This is however misleading. What happened was as follows. After the elections, some Iraqiyya and INA members have continued their vivid exegesis of the Iraqi constitution to claim that the current government is a caretaker government. This reached its height in late July, when a legal counsel to Nuri al-Maliki, Tariq Harb, presented an elegant, diplomatic and constitutionally correct refutation by saying that the current government was for practical purposes a caretaker government, since the constitution explicitly demands parliamentary consent for certain decisions (treaties etc.) and since parliament is not operational. In other words, the current Iraqi government could perhaps be construed as a de facto caretaker government, but surely any attempt at a de jure designation of it as a caretaker government would be unconstitutional – one might as well declare Mithal al-Alusi the King of Iraq, since that kind of action similarly has no legal basis. Nonetheless, some Sadrists and other INA members shouted loud hurrahs afterwards, claiming victory; Melkert then flew off to the UNSC with his interpretation of the events based on the INA version and it later ended up in the Obama speech. Why should we care about these ridiculous details? Because the US government seems to underestimate the extent to which competing interpretations of the constitution may be used to determine who should form the next government in Iraq. For example, how will Iraqiyya react if its claim to a privileged role in forming the next government is trumped by an all-Shiite alliance? How will the Shiite alliance, in turn, respond to US-inspired attempts to check the powers of the prime minister that are not in the constitution? If the US government wishes to make a meaningful contribution to forming the next government in Iraq and assist the Iraqis in identifying solutions that are both realistic and constitutionally acceptable, it should pay greater attention to what is in the constitution and what is not. It may however be too late, since the drift towards a focus on the putative pan-Shiite alliance has strengthened during Ramadan, which on top of the legal issues brings up the issue of stalemate within that alliance. Often it is forgotten that the problems we are seeing between INA and Maliki in many ways go back not to 2009 or 2005 but rather to the 1980s when the Daawa seceded from SCIRI in Iran. Starting tomorrow Thursday, business in Iraq is expected to grind to a complete halt until the middle of next week on account of the Eid al-Fitr festivities marking the end of Ramadan. Pretty much in line with expectations, nothing truly significant has happened during the past month in terms of steps towards forming a new government. There has been a slight shift of emphasis in the media headlines as the secular Iraqiyya has finally begun realising what others have tried to suggest to them for some time: The Shiite-led INA was only joking during its supposed “rapprochement” with them, and probably never seriously considered accepting Ayad Allawi as premier, using the dialogue with Iraqiyya simply for leverage in its ongoing negotiations with others. Instead, both INA and the other Shiite-led list, Nuri al-Maliki’s SLA, now seem increasingly focused on winning the premier nomination within the framework of what is still only a theoretical construction: The pan-Shiite National Alliance (NA) that would combine both INA and SLA and claim the premiership on the basis of that post-election bloc – a procedure whose legality remains disputed as far as Iraqiyya is concerned. It is however probable inadvisable to stop breathing while waiting for the outcome of the internal NA process, even though INA lately named Adel Abd al-Mahdi as its candidate to face off against Maliki. Just to give an indication of where we are right now, today’s headlines on this subject from Iraq involved one statement that “the NA does not have a timeline for selecting its premier candidate ” whereas the other emphasised that the modalities for selecting the premier candidate would be “set out in writing”, that is, if they are ever arrived at. A meeting after the Eid has been agreed on in principle but no date has been set. What we know so far is that one proposal is that the decision be taken within the committee of “14 wise men”, also referred to sometimes as the “leadership committee” of the NA with a majority threshold at 9 votes. The distribution of votes within that committee is supposedly 7 for SLA (4 Daawa, 1 Daawa/Tanzim al-Iraq, 2 Independents) and 7 for INA (3 Sadrists, 2 ISCI/Badr, 1 Jaafari wing – some reports say this seat is “shared” with Chalabi’s INC, whatever that could mean – 1 Fadila). As far as the reported composition of the committee is concerned, it is noteworthy that the SLA bench may look more coherent than the INA one and would only need two INA votes in order to win, but there have been some disputes lately concerning the exact status of Tareq Najm of the Daawa (and supposedly still in charge as director of Maliki’s office, although some say he has been granted sick leave), and moreover at least two of these SLA representatives (Sunayd and Adib) were loud advocates of joining INA back in August 2009. As for the INA contingent, probably the only votes that are safe from the point of view of Abd al-Mahdi are the 2 ISCI/Badr ones. The rest are probably up for sale, although it should not be excluded that the Sadrists might still be hoping for some kind of even more unknown compromise candidate to emerge and that their initial vote for Abd al-Mahdi was a wholly tactical one. One of the few things the internal NA meeting agreed on though was that the previous ISCI proposal of entering parliament with more than one candidate is indeed unconstitutional and that option is therefore no longer on the table. In a fascinating replay of what happened inside the Shiite alliance (UIA) in March and April 2006, Adel Abd al-Mahdi of ISCI has emerged as the main challenger to the other prominent premier candidate for what is still only a theoretical project of a new Shiite alliance (NA), Nuri al-Maliki of the Daawa party. Back then Abd al-Mahdi had been a frontrunner for the job as well but lost out to Ibrahim al-Jaafari, partly out of fears from others that Abd al-Mahdi would give away too much power to the Kurds. Jaafari was subsequently replaced by Maliki. Still, it may be the contrasts with 2006 that after all are most important this time. In the first place, the power bases and the numbers are different, in addition to the fact that no full merger between the two would-be component of the Shiite alliance, Abd al-Mahdi’s INA and Maliki’s SLA, has so far taken place. Back then, Maliki ultimately won the job on the basis of supports from Sadrists and independents in addition to his own Daawa base. This time around, the Sadrists have been anti-Maliki although they have also been pretty reluctant to embrace Abd al-Mahdi, according him a very low score in the “straw poll” of premier candidates held right after the 7 March elections, and for a long time having favoured former premier Ibrahim al-Jaafari (who together with Ahmad Chalabi was reportedly the only major absentee at today’s decision by INA). For his part, Maliki has for the past years managed to build up a substantial power base of his own, meaning that inside the putative NA, he commands the weight of 89 seats whereas Abd al-Mahdi’s INA accounts for slightly less (70). Add to that the fact that SLA contains a floating mass of at least a couple of dozen MPs – including some from the Tanzim al-Iraq branch of the Daawa and some from Maliki’s own branch – that expressed an interest for a full merger with INA as early as last summer and may be more inclined to compromise with them for that reason, and the complexity of the matter becomes clearer. Reflecting this situation, the modalities for deciding the competition between the two have not yet been decided, although several suggested mechanisms have been floated. Another key difference concerns timing and procedure for the further process. Back in 2006, a two-thirds majority was required to elect the presidential council and this established the effective threshold for electing the premier (whose nomination was to be done by the presidency). Accordingly, when the first UIA candidate, Ibrahim al-Jaafari, faced resistance from the Kurds and others, he dropped out of the competition. Conversely, when Maliki emerged as a compromise candidate, not even the Kurds had the audacity to attempt a second veto and the rest of the government-formation process went reasonably smoothly, with the government seated in around 50 days after Maliki’s emergence as a compromise candidate. This time around, though, even if the Shiite alliance should be able to agree on a single candidate – only then would it in fact exist as a relevant bloc or kutla according to even the most flexible reading of the Iraqi constitution – there would still be a long way to go. Firstly it seems unlikely that the secular Iraqiyya will accept a government formed on this basis, since it has been making the case for a stricter interpretation of the constitution based on electoral results all the way. The possible exception in this case is that Abd al-Mahdi is well liked as a person among several high-ranking Iraqiyya leaders, though perhaps more so among the Wifaq ones than others and any cave-in by them to an NA demand for the premiership would likely meet with considerable defections from the other components of Iraqiyya and the end result could be a repeat of the “Tawafuq syndrome” of the previous parliament or even something less, with weak representation of the areas controlled by the central government north of Baghdad. Secondly, a deal with the Kurds is not a foregone conclusion this time, since the Kurdish votes are not needed to seat the government, and since their demands so far have been pretty extravagant. If they overplay their hand, they, too, might risk marginalisation as a result. Thirdly, the loser of the internal Shiite competition will still have cards to play for these reasons, depending to some extent on the numbers involved in the final struggle. For example, if the vote is close and Maliki loses, he could still turn to Iraqiyya and try to be more generous with them. In terms of chronology, next week will mark the high point of the Ramadan celebrations, so settling the internal Shiite issue will likely not begin in earnest until 15 September. In other words, unless the Iraqis rush faster than in 2006, a government on this side of the US midterm elections on 2 November might prove difficult. “Iraq is free to chart its own course”. 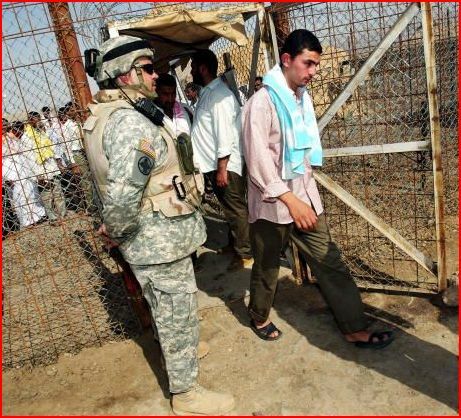 The message from the Obama administration as Operation Iraqi Freedom came to an end sounded wonderful, like the release from captivity of a beautiful bird. Alas, Iraq today is anything but a beautiful bird. Rather it is a wounded prisoner, incarcerated for the past seven years in a mental prison. True, things were not great before 2003 either: Back then, Iraq was ruled by a brutal regime whose excesses would at times assume sectarian or racist forms. Nonetheless, equally problematic, in a different way, are the acts of the motley crew of members of the “international community” whose task it was to rehabilitate the victims of the Iraq War after 2003 and put the country on the right path to true freedom. Instead, through their blind insistence on a discourse of ethnic and sectarian division they gave political opportunists returning from exile a head start and charted the way for a constitution and a political system that resonate poorly with the Iraq’s historical past. To truly appreciate the immensity of this crime and the degree of complicity in it among Western intellectuals more generally, let’s not focus here on the big, famous or powerful, whose agendas and intellectual parameters are well known. They include of course people like Paul Bremer, Peter Galbraith, Joe Biden, Chris Hill and Ad Melkert who in their various ways have all insisted on dividing the Iraqis territorially and conceptually, as if ethno-religious communities somehow constituted distinct branches of humanity. And let’s not go so much into what journalists have done in this regard, except mentioning that probably the most consistent offender is the elusive “Qassim Abdul-Zahra” of AFP/AP (probably a pen name) as well as pretty much every Baghdad correspondent that has worked for the BBC over the past seven years (yesterday, the BBC simply subtitled an interview with Ala Makki of Iraqiyya with “Sunni MP”. How would they describe Ayad Allawi of the same secular party?) No, let’s instead look at the writings of a less known, bright young American professor at Harvard who in many ways has tried to engage in constructive dialogue with the Islamic world and at one point in 2004 also had a role as a consultant on the Transitional Administrative Law that governed Iraq from 2004 to 2005. Even he cannot get Iraqi history right. So Feldman claims Iraqi Shiites are less identified with the Iraqi nation than the Sunnis! The only problem with that bold assertion is that it totally lacks an empirical basis. Had the Harvard professor bothered to read Iraqi newspapers from the 1920s, he would have been astonished by the countless contributions by prominent Shiite intellectuals who celebrated Iraqi nationalism and their alliance with the (mainly Sunni) population in the northern areas of Iraq in opposing the British presence at the time. Muhammad Mahdi al-Basir from Hilla and Jaafar Abu Timman from Baghdad are but a few examples that come to mind. As for Feldman’s assertion elsewhere in the article that Iraq was somehow “born” as a result of British machinations, why doesn’t he turn to the Lughat al-Arab journal that was published in Baghdad in the Young Turk era (1908–1914)? It is in fact littered with patriotic references to Iraq as a watan (homeland) in articles by writers like Anastas al-Karmili (a Christian) and Kazim al-Dujayli (a Shiite). There has been much talk about conspiracies by hostile powers to divide Iraq into separate statelets, and most of it is probably unfounded. This partition conspiracy, however, is real and since it mostly goes undiagnosed it represents arguably far most dangerous aspect of the Iraq War: Brilliant Western academics who may have the best possible intentions towards Iraq and its people but who in an attempt at sounding sophisticated perpetuate the toxic paradigm of a tripartite Iraq – be it territorially or sociologically – simply because they have failed to study the country’s history properly through primary sources. The suggestion is not that sectarian and ethnic issues are non-existent in Iraqi history. But if Western academics had stopped reproducing what are outright lies about the origins of the modern Iraqi state, the whole climate of the discourse on Iraq would have looked vastly different. Rewrite that Feldman op-ed, delete everything that is empirically incorrect about Iraq’s history, and check to see how much is left of the original argument. Operation Iraqi Freedom may be over, but Operation Iraqi Partition lives on, regardless of Security Council resolutions or status of forces agreements. Unfortunately, there is no anti-war movement against it in the Western world because most of the academics there are in fact its loyal soldiers.